These super lightweight boots from the running-shoe experts Hoka One One are designed, the company says, for fast-moving walkers. 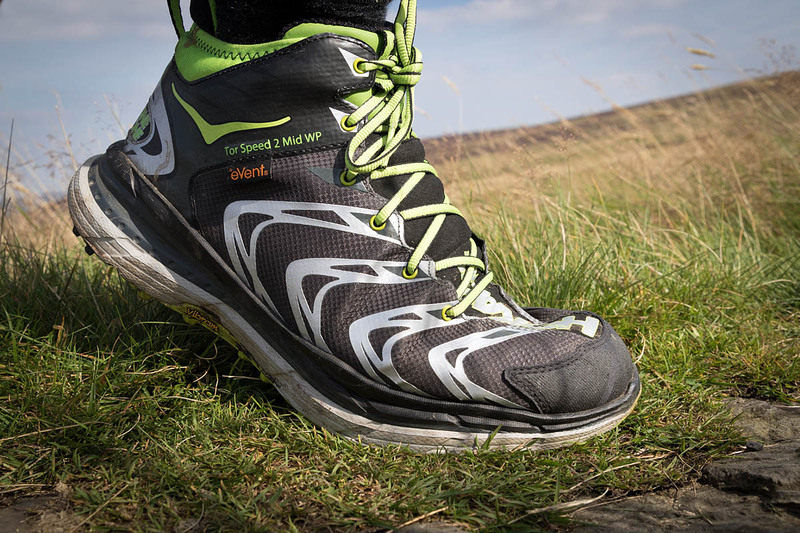 The Tor Speed 2 WP are mid-height, offering hikers a little more protection than a shoe. Uppers are fabric, with the addition of rubber protection at the toe. The rear section of the upper has a nylon overlay, and the heel cup is stiffened to give protection in this area. The design is striking, so if you’re after a staid brown boot, look elsewhere. 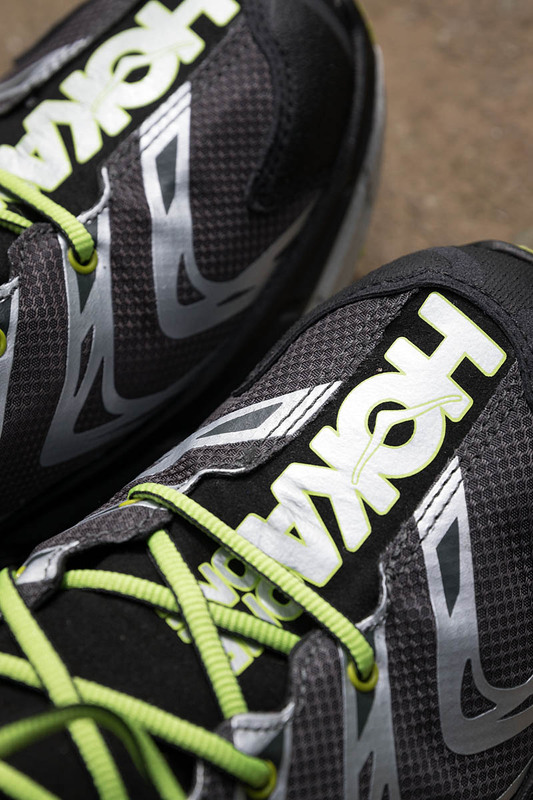 There are silver rounded chevrons running up each side of the forefoot area, and a large silver Hoka One One logo at the toe and branding at the heel. Bright green detail and laces contrast with the overall black and grey design. The uppers are soft enough to give comfort while affording support to the foot, and the lacing enables a good snug fit that stops the foot moving about. We wouldn’t advise scree running or tackling very rocky mountain sections in these boots, but that’s not what they’re designed for. 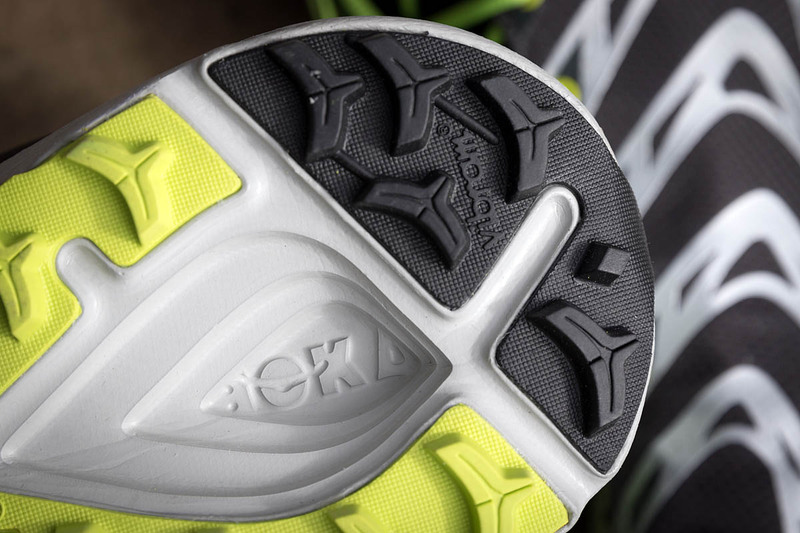 Comfort on treks and trails is where the Tor Speed 2 WP is aimed and it accomplishes this well. The sole unit gives a large amount of underfoot cushioning, thanks to a combination of the Vibram high-traction outsole, which uses MegaGrip compound; a full-length EVA midsole at the top, with an additional RMAT midsole – a combination of EVA and rubber – to provide support. The insole is an Ortholite model which has a little additional cushioning, along with anti-microbial properties. All this makes for lots of shock absorbing under the foot, and on extended walks using lots of hard surfaces such as gravel and paving flags, our feet remained happy feet. The sole has a pronounced rocker which made for an easy walking action. A rubberised rand rises just a little way up the uppers, and the ankle collar and tongue have just about the right amount of padding for comfort while retaining the super lightweight design ethos. The boots have an eVent waterproof membrane which kept the rain out, but water can get in from the top of the boot because the tongue bellows end just below the second lace-hole from the top, meaning there’s really only protection there to about the height of a shoe. In practice, this means in rain, you have to try to ensure your trousers or overtrousers cover the boots to this level – not always easy on the move and impossible if you’re wearing shorts. If the bellows were extended upwards by two or three centimetres, this would give better protection against water entering from the top. Grip from the unusual outsole was good. There is no traditional heel step which would normally provide downhill braking. Rather, the whole sole has a continuous curved sweep, from the back of the heel to the tip of the toe. There is a fairly deep indentation in the heel area of the outsole, and there is also diagonal groove in this area. Yet the Tor Speed 2 WP performed admirably both in uphill traction and downhill braking. The 5mm lugs in the MegaGrip sole were very good on dry and wet rock, on wet grass and on firm mud. Footing was assured and gave confidence both uphill and on steep downhill sections, including stone flags. Sizing of the boots was about normal, perhaps just about a quarter of a size on the small side. For us, the outside of the forefoot felt a little constrained, with the little toe pressed right up against the fabric. As with all footwear, we advise trying them on to see if they fit your foot. 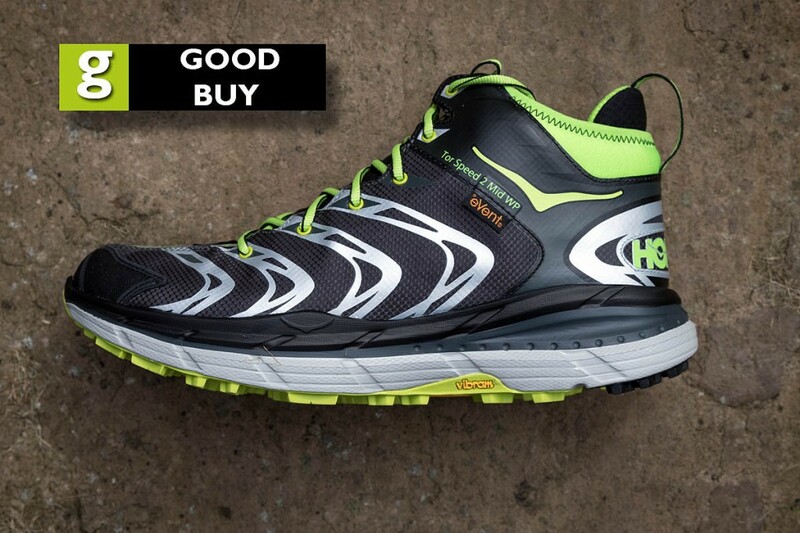 The exceptional underfoot cushioning, supportive yet supple uppers and very light weight of these Hoka One One boots made for a very comfortable walking experience. They’re ideal for long trips, where fatigue and pounding on the sole would normally be a major concern. We wouldn’t expect lightweight fabric boots to stand up to prolonged punishment on routes where you’re likely to encounter sharp rocks and scree, but on the trail, the comfortable Tor Speed 2 WP boots really come into their own. The boots were supplied to grough by Hoka One One.